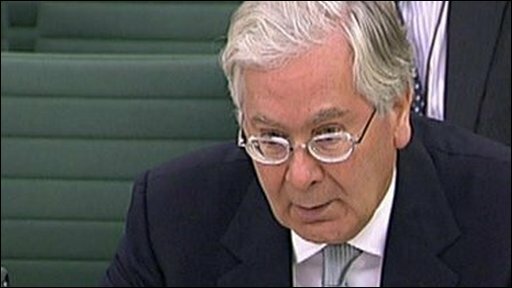 Mervyn King: "Inflation over the next year is likely to be volatile"
There are signs that the UK economy is growing again, the governor of the Bank of England, Mervyn King, has said. But he added that the "strength and sustainability" of the recovery are still "highly uncertain", in comments made to the Treasury Select Committee. Mr King said the state of the banking system, levels of debt, and the global economy were all drags on growth. He was speaking after figures showed a key measure of inflation has fallen to its lowest level since February 2005. The Consumer Prices Index (CPI) dropped to an annual rate of 1.6% in August from 1.8% in July. But the Retail Prices Index (RPI) inflation measure, which includes mortgage interest payments and housing costs, rose, to -1.3% from -1.4%. Mr King said inflation "is likely to be volatile" over the next year. "Following a precipitate fall in economic activity at the end of last year and the start of this, there are now signs that growth has resumed in the third quarter," Mr King said. But he argued there were three "headwinds" that could make the recovery "somewhat slower and more protracted that we might otherwise have thought". First, he said banks' willingness to lend was a drag on the UK economy. "Conditions for big companies to raise finance have improved significantly, but small and medium firms are still finding it difficult," he said. Second, he argued that companies and individuals are focusing on repaying debt, rather than the spending on products or services which is needed to boost overall economic activity. Finally, he said the UK relied to some extent on what was happening in the rest of the world. "We've had more encouraging news on that in the past couple of months, particularly in Asia," he said. The UK economy contracted by 0.7% between April and June, a significant improvement on the 2.4% fall in the first three months of the year. Many observers believe the economy will return to growth in the current quarter, marking an end to the recession. However, most believe that any recovery will be weak, with rising unemployment hindering stronger growth. On Monday, the European Commission forecast the UK economy to grow by 0.2% between July and September. This is less than France and Germany, which have already emerged from recession, as has Japan.